The weeds are taking over now, strangling the old race track in a web of green, obscuring little by little the dirt that once gave the place its identity. The proprietors have allowed local tree-trimming companies to dump their wood chips here, which helps cut down on the mud. The only original structures remaining are the concrete support for the grandstand, and a rusted guardrail running along what was once the backstretch. On one recent morning, heavy construction equipment was being unloaded for a job fair. The only racing that goes on here now is of the 4x4 variety, on a rock obstacle course tucked inside what used to be Turn 3. This is what remains of the race track at the Piedmont Interstate Fairgrounds, a half-mile oval that hosted events on NASCAR's premier circuit from 1953-66, a facility where native son David Pearson became hooked on racing as a youngster and later made his first start behind the wheel. The venue itself wasn't necessarily famous, or even particularly memorable, but it was a center of attention in a racing town not far from the Appalachian foothills where the sport got its start. Seven years ago they restored it, bringing the old track back to life so Pearson and other legends could race coupes to raise money for a museum project. Since then, it's been allowed to deteriorate -- much like the racing legacy in this old textile town. 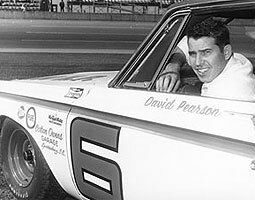 David Pearson won 27 races in Cotton Owens' No. 6 Dodge. They call it "Hub City," a nickname bestowed on Spartanburg more than 100 years ago because of all the trains that passed through town each day. And yet the moniker could have very well sprung from the city's once-prominent place in NASCAR, given that for nearly two decades, nowhere else in America was as closely tied to stock-car racing. The local promoter was a confidante of Bill France, and was present at the meeting at the Streamline Hotel in Daytona Beach where NASCAR was born. For years journalists covering the sport convened on the city for their annual convention. And then there were the teams, a dozen of them based in Spartanburg or its immediate environs, in shops that fielded cars for many of the greats of the age. Pearson, Bobby Isaac, Ralph Earnhardt, Pete Hamilton and Charlie Glotzbach raced for Cotton Owens. Bobby Allison raced for Mario Rossi. Joe Weatherly, Tiny Lund, Buddy Baker, Dale Earnhardt and Ricky Rudd raced for Bud Moore. Rex White raced for Louis Clements before setting up his own shop, as did James Hylton, Joe Frasson and Jack Smith. G.C. Spencer, Fonty Flock, Joe Eubanks, Tommy Irvin, Speedy Thompson, Ned Jarrett, Darel Dieringer, Billy Wade -- the list of drivers who came through Spartanburg goes on and on and on. NASCAR's former chief scorer, Joe Epton, was a native. So was longtime NASCAR and International Speedway Corp. executive Jim Foster, once the local paper's sports editor. From the late 1940s through the mid-60s, when the migration north toward Charlotte inevitably began, Spartanburg was the unquestioned capital of the sport. "It seemed like all the top guys were there," said Jim Hunter, a NASCAR vice president who once covered races at the Piedmont Interstate Fairgrounds track as a journalist. "If you had a who's who of NASCAR, you immediately thought of Spartanburg." It didn't last, of course. Other cities in the region grew while Spartanburg contracted. The city's leadership made one fateful, short-sighted decision that all but ended the area's brief but glorious reign as the hub of NASCAR. Today, almost every race team at the sport's national level is headquartered around Charlotte, just 75 miles away. One exception is Phoenix Racing, which moved into a vacant Spartanburg shop six years ago and won Sunday's event at Talladega. It was the first victory for a Spartanburg-based team at the Cup level since Moore's final win, which came in 1993 at Sonoma, with Geoffrey Bodine behind the wheel. Yet other reminders of Spartanburg's NASCAR past are scattered and few. The old racers who still live here just shake their head and wonder what happened, believing in their hearts that had a few things unfolded differently, their city would be the vibrant, integral hub of racing that Charlotte is today. 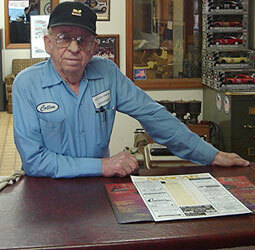 "You had it going on," said Hylton, whose modest shop on the outskirts of town still stands. "Then it was kind of like somebody cut the fence, and they escaped." The brick building off Fairview Avenue has been empty for a little while now, and it shows. A back lot behind a high fence topped with razor wire, a place where team transporters used to park, is now strewn with debris. The weathered garage bay door is locked shut. What was once the home of Bud Moore Engineering, a Spartanburg institution that won 63 races and two championships in 38 years on NASCAR's premier circuit, was recently purchased by Converse College and eventually will be used for storage. Small, laminated signs tacked to the front of the facility warn visitors to keep out. Perhaps no single structure better symbolizes the rise and decline of NASCAR in Spartanburg better than Moore's old building, which the former team owner built in 1963. It housed one of NASCAR's better organizations, a stepping stone for up-and-coming drivers like Rudd and Earnhardt that was competitive until the mid-1990s and remained in Spartanburg long after all the other teams had moved out. But eventually sponsorship struggles set in, and performance began to suffer, and in 1999 Moore sold out to two brothers from California. They couldn't make a go of it, and in 2002 the building was sold at auction for a mere $55,000. 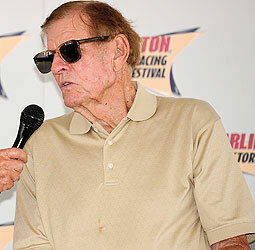 Bud Moore won 63 races as an owner. It used to be so different. In the early 1950s race teams began popping up around Spartanburg thanks primarily to its centralized location, so near to so many of the tracks that comprised the NASCAR circuit at the time. Others were attracted by the type of steel local manufacturers used to make spindles, or the lure of obtaining a car made by Cotton Owens or an engine crafted by Moore. Thousands packed the grandstands over at the fairgrounds whenever the big show came to town. Owens, now 84 and operating a Chrysler salvage yard, remembers riding his bicycle to a midget race at Duncan Park, a local baseball stadium, in 1942. He sneaked in by climbing a fence, got kicked out, and paid the 25-cent admission price. That midget race was promoted by Joe Littlejohn, who eventually would organize many of the region's tracks into the South Carolina Racing Association, a sanctioning body that ultimately was absorbed by NASCAR. It was Littlejohn, inspired by the beach-road races at Daytona, who in 1938 convinced a reticent Spartanburg city council into letting him race cars on a fairgrounds dirt track that had been limited to harness racing. "They said, 'What in the world do you want to do, kill everybody in Spartanburg?'" he recalled years ago. "I said, 'No, I'm not planning on hurting anybody.'" Littlejohn later promoted NASCAR races at the facility, opened a motel where the National Motorsports Press Association held its annual convention, and gained the ear and the respect of France. When France called promoters to the Streamline Hotel in 1947 to unify the sport under the NASCAR banner, Littlejohn was there. Although the juggernaut Petty Enterprises operation was located up the road in North Carolina, teams from Spartanburg regularly won races and contended for championships. Moore and Owens, both native sons, were among the top car owners of their day. And then there was Pearson, a gruff, tough product of the city's textile culture, who embodied the spirit and mentality of the place. The man whose 105 race wins eventually would rank second on NASCAR's all-time victory list would climb trees as a youngster to get a glimpse of action on the fairgrounds track. Once when someone asked him where he went to school, he said WMU -- short for "Whitney Mill University," playing off the name of the hard-knock mill village where Pearson had grown up. For a while, at least, racing gave Spartanburg an identity, and provided locals with an escape from the textile looms that consumed so many of their waking hours. By all accounts, Grand National races at the fairgrounds -- a broad half-mile with a slick surface and tricky corners that could send cars spinning -- drew crowds of 12,000 or more. The city was a magnet for mechanics or fabricators hoping to break into the sport, just as Charlotte is today. Cotton Owens won 38 races as an owner. "With that many teams around, there were a lot of other people moving into Spartanburg that wanted to go racing and work on a race team and that kind of stuff," Moore remembered. "We had quite a few people who did move into Spartanburg who were good mechanics and they wanted to go racing. That's why it made things real good around Spartanburg, with all the jobs and everything that was created by having that many race teams around. A lot of these people moved in from up north. They wanted to move south to start with, and they moved in here and got a job at a race team." But in the early 1960s, things began to change. Charlotte Motor Speedway, a harbinger of the massive tracks that would come to dominate NASCAR's premier circuit, opened in 1960, and a liberal testing policy meant teams could take to the facility almost anytime they wanted. Then in 1962, John Holman -- half of the iconic Holman-Moody operation -- opened a shop in Charlotte, and began hiring top machinists and manufacturing custom parts with unparalleled quality. His facility could build engines, had an in-house dynamometer, could do things better and faster than many of the folks in Spartanburg could. In the days before overnight mail, proximity mattered, so teams gravitated toward Charlotte as a result. "His shop could do most anything," Owens said. "He hired good people, and you got good stuff from him. We started making safety valves here in Spartanburg for the fuel cells. He took those and started having them cast. It was such an easier job, and lighter than hand-made. He did stuff like that that just drew the teams closer to them. They went where they could pick the stuff up right from him." And suddenly, Spartanburg had been left behind. Although foreign investment has proven to be a boon to the county at large -- BMW and Michelin both have manufacturing plants in the region -- the city itself has a population smaller than it did in 1960, when NASCAR's interests in the area were at their peak. Charlotte now has all those modern, steel and glass race shops. 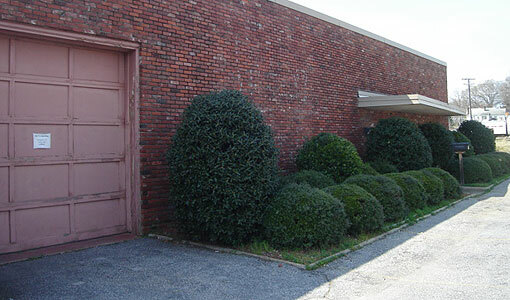 Spartanburg has Moore's old building, shuttered and locked, with absolutely no outward sign of what it used to be. 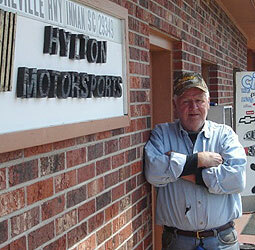 "I've always said that race car drivers were like sheep," Hylton said. "Once the lead sheep takes off, everybody follows." Wayne Harmon's golf cart bounces over the rocky, uneven soil that race cars once traversed at 100 mph. As the executive director of the Piedmont Interstate Fair, Harmon has seen the old race track astride his midway fall into decay, be reborn in 2002 for a charity race to benefit a hoped-for motorsports museum, and deteriorate again. This time, there will be no saving it. The weeds and roots and wood chips are moving in on the old half-mile facility, and soon will envelop it. 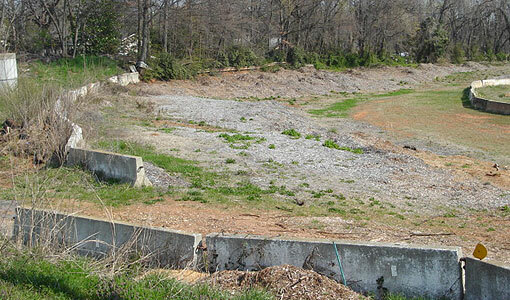 Weeds and rocky terrain now cover what once was the fourth turn at the old Piedmont Interstate Fairgrounds. Turner Sports New Media. "It's gone," Harmon said on a recent morning as he gave a visitor a tour of the old track. "It's not coming back." It wasn't famous like the big track over in Darlington, it wasn't mean and nasty like the half-mile down in Columbia, but to the men who raced out of Spartanburg, it was home. NASCAR's premier series competed 22 times on the fairgrounds track, with Lee Petty winning the first event in 1953 and one-time local driver Elmo Langley claiming the finale 13 years later -- a race more famous, Hunter remembers, for Ned Jarrett tossing his helmet at Pearson after the two had been involved in an incident. It was a wide half-mile track, and the corners were all a little different, and the clay would get hard, dry and slick. "It was a good dirt track. In fact, I enjoyed running on it," said Pearson, who never won a premier-level event at the facility. "It was a slick race track. [Turns] 3 and 4 were a lot different and seemed like they were wider than 1 and 2. [Turns] 1 and 2 were like asphalt with sand on it, and it would really get hard and slick. But 3 and 4 were real nice. Both turns were little bit different. The No. 1 turn, you couldn't get into it as hard as people thought you could. There were a lot of spinouts and wrecks and things like that." 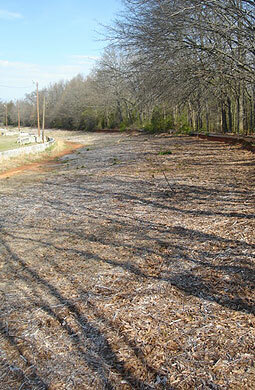 The dirt surface at the old Piedmont Interstate Fairgrounds is now covered in wood chips. The rusted guardrail at far right is one of the few original parts of the facility. The track was virtually abandoned until it was restored for the charity event. Harmon and his team pored over old photographs to get an idea of what the place looked like in its heyday. Since there were no inside or outside retaining walls, dozens of white, concrete Jersey barriers were brought in to line both sides of the racing surface. The final result was "almost identical," to the way the track used to be, Harmon said, and the charity event was such a hit that the city allowed the fair to hold three races a year at the facility. They were good intentions soon dashed by reality. There were no lights, no catch fences, no modern safety systems. Local drivers turned out in force, lining up along residential streets and outside front porches to enter the track on race day, eager to compete on the same oval that Pearson and Owens and Petty once did. But the crowds never materialized. Low attendance simply couldn't support the endeavor, and the track was turned back over to the clover and chickweed. "We couldn't keep it up," Harmon said. "The racing, I could get the drivers and the cars, but no people to watch it. Oh, I'd have 100 cars, but nobody up there [in the grandstand], and we couldn't pay out." Yet the fairgrounds track isn't the one for which old Spartanburg racers rue the loss. No, they shake their heads in disbelief at what became of another facility, this one planned for 580 acres of property at the local airport three miles outside of town. France came and personally surveyed the area, and by some accounts even promised to throw in a new terminal building and runway. He thought the two major interstate highways running through town would make it easy for fans to get in and out. In the early 1960s, just as Spartanburg was beginning to lose its place in NASCAR, the idea was pitched. And the city council, overseers of the hub of American stock-car racing, turned it down. So France went elsewhere. "He was looking for someplace that would support racing," Hunter remembered, "and he found it with [former governor] George Wallace in Alabama." And Talladega Superspeedway was born, on a patch of rocky Alabama soil adjacent to an airport and a major interstate highway. The old racers who live in Spartanburg still can't believe that it happened, still can't fathom how a city at the time so steeped in NASCAR could let a premier racing facility slip away. Some of them still refer to Talladega as "Spartanburg's race track" although the first shovelful of dirt never was turned. Floating around town are blueprints showing a 2.5-mile tri-oval that would have ushered Spartanburg into the modern era of racing. It proved to be a fantasy. "The city fathers didn't approve of it," Hylton said. "They stuck a knife in their hearts, their own hearts. Because if the city fathers in Spartanburg and Spartanburg County had approved that, this would be Talladega. This sure would. There probably wouldn't be a Charlotte. There probably would have never been a Charlotte. Probably Charlotte would have never happened. But that's politics. Politics will eat you up." Why was it rejected? No one is certain. It could have been objection to noise and traffic, or reservations about such activities on a Sunday -- this in a buckle of the Bible Belt, where until recently blue laws were still enforced. No matter that, according to a study conducted last year by the Washington Economics Group, Talladega Superspeedway generates an economic impact of $407 million and creates nearly 8,000 jobs in Alabama. "You know how people are, old timers who have been around a long time. We don't want it right here, it would be too much noise and things like that," Pearson said. "They didn't really realize how much money it would have brought into Spartanburg. It would have been a good thing. It would have been nice to have it here in Spartanburg." These days, Spartanburg Downtown Airport has a modest tower and a single runway used exclusively by private and corporate aircraft, since passenger air service ended in 1962. There are a few hangars, some small planes sitting on a tarmac, and trees all the way around the property. Only the racers know what the place might have been. And 40 years later, the subject still leaves them agitated. "All the people who had a vote on that really didn't understand racing," Hylton said. "They really didn't have a clue as to what the future held. Even though Spartanburg was the center of racing at the time, they didn't have the foresight, which is how I look at it. That's too bad." Beaumont Mill is a handsome building off North Pine Street, a red brick edifice with a single smokestack rising toward the sky. Like many former cotton mills in this part of the country, it was left idle after the textile industry collapsed. It's since been restored, updated with new windows and an air-conditioning system, although a visitor pressing his face to the glass sees only rows of steel columns and the empty space beyond. The only visible tenant is the Southern Conference, a small-college athletic league. 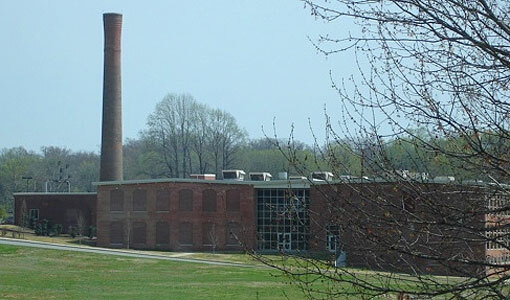 Beaumont Mill, a former cotton mill that was the planned home of the South Carolina Racing Museum, a project that never materialized. Turner Sports New Media. This was supposed to be the site of Spartanburg's monument to its racing heritage, the South Carolina Racing Museum, at long last a place where all those memories of Bud and Cotton and Pearson and others could be consolidated under one roof. The project was hatched in the early 2000s, and seemed to have overwhelming support. The former racers in the area put their names behind it. The space in the old mill would be donated. The legends race at the restored fairgrounds track raised money for it. Pearson built a car and traveled around, making appearances and raising cash. Spartanburg's city council approved a plan committing $300,000 a year to the project for 10 years. Even a federal earmark was wrangled. The goal was a $20 million showpiece to open by 2005, a museum with interactive displays that would chronicle the state's role in racing from the 1930s to the present. It would be a magnet for race fans passing through town on their ways to events in Atlanta, Charlotte, Darlington, Bristol, and elsewhere, an economic shot in the arm for Spartanburg, and a long-overdue reminder of the city's place in the sport. Yet today, Beaumont Mill still sits mostly empty. Like the proposed superspeedway project of the 1960s, the racing museum was an idea that never became reality. "I think the biggest problem was, the people helping us with the thing had their sights set a little bit too high," Moore said. "We had the thing set at about $20 million. We were against that to start with, because we thought that was a little too much money. So they set the first stage at, I think, $11 million. We had raised somewhere around $6 million. The people who owned the property, we had a certain length of time to get started on everything ... [and] we just couldn't raise that much money. We always thought their sights were set too high. We wanted to set the first stage at about $7-8 million instead of $11 [million]. We couldn't reach that goal. That's what kind of knocked it in the head." It's a sensitive subject even today, with plenty of fingers pointed in plenty of different directions. Some who were involved in the project still aren't comfortable talking about it. But by all accounts, it seems the museum's fund-raising efforts fell woefully short. The money committed by the city was marked for operational funds, and given that the museum never opened, those funds were never spent. Money raised by Pearson's appearances, the legends race at the fairgrounds track, and other means went toward pre-development expenses such as design work, promotion and planning, necessary costs in a project of that scope. But according to some with knowledge of the project, the funds raised were never enough to cover the museum's hard costs, and the plan stalled. But there was another factor at play, as well. A few years after plans for Spartanburg's museum was announced, NASCAR opened the bidding for its Hall of Fame project. In 2006, Charlotte was selected as the site. Any final, lingering hopes of a Spartanburg racing museum were dashed by the thought of a NASCAR-backed project 75 miles away. Once again, Spartanburg had been outdone by its more famous neighbor to the north. Although the announcement of Charlotte as the Hall of Fame site came after the idea for the South Carolina Racing Museum had withered, some familiar with the Spartanburg project believe that Charlotte's position as clear frontrunner for the NASCAR shrine undoubtedly had an effect. Pearson remembers Foster, the former Spartanburg sports editor, being sent to the city by then-NASCAR chairman Bill France Jr. to look into the project. This was at a time when Darlington's future was tenuous, and there was even some talk of moving the cars from Darlington's NMPA museum to Spartanburg if that facility shut down. "When he left, we were on cloud nine. We thought we were going to get a museum for sure," Owens remembered. "We tried to get NASCAR to support us, and at one time there they talked like they were," Pearson added. "They were going to close Darlington. France even sent Jim Foster up here to see what it was going to be like, and we gave him big boxes of stuff of what it was going to be like and how we were going to build things and do things and stuff like that. When he was up here, we thought maybe we were going to get the cars out of Darlington, too, to go in it. We thought they were going to close it down, and then somebody saw in the paper that France was going to build a museum somewhere exactly like what we were going to do." Once that happened, Pearson said, the Spartanburg facility wasn't going to be able to use the NASCAR name. While it seems unthinkable that NASCAR would move or delay a needed Hall of Fame project out of deference to a South Carolina mill town -- Spartanburg didn't bid for the Hall of Fame, Hunter confirmed -- the old racers still were angry. They felt they had been undercut. Hard feelings set in for a while. Ask Owens if any of his cars will be displayed in the Hall of Fame, and he demands a tape recorder be shut off before voicing his true feelings. James Hylton at his shop in Inman, S.C., outside Spartanburg. "I tried to tell David and Cotton, the location of that mill was not really accessible to the interstate," Hunter said. Then he searches for an analogy to describe Spartanburg then and now. "The first race at Darlington, they didn't inspect the cars at the track. About two miles down [U.S. Highway] 52 toward Hartsville, the sheriff lived in a house on the right. And he had a shed in his backyard, and that's where inspection took place. Now, it's overgrown with stuff. I point it out to people, and they say, 'Get out of here.'" Many would have the same reaction when informed that Spartanburg was once as integral to NASCAR as Charlotte is today. There aren't many reminders of that era -- Moore's old building, the remains of the fairgrounds track, Hylton's shop over in Inman, the photos on the walls of Owens' salvage business. The only sign of life is at the intersection of Interstate 85 and U.S. Highway 221, where James Finch now operates his Phoenix Racing team out of the old Buckshot Racing shop. The organization, which fields Nationwide and Sprint Cup cars, employs about 25 people. But Finch's outfit is an anomaly. The big teams, the ones that once made Spartanburg a beehive of NASCAR activity, have long since moved off or faded away. What's left are the people, men like Pearson and Moore and Owens and Hylton, racers who still live in the area and are more than willing to share stories about what the Hub City was like when it truly was the hub of NASCAR. Once they're gone? Who knows. Owens wonders if the people who walk the streets of Spartanburg every day have any idea of what their city used to be. "I don't think they ever realized that," he said. "I just don't think it's ever been brought to their attention. This is where a lot of it's grown from."